Recently acquired by the British Museum, this 14th century alabaster figure of the Virgin and Child is the best preserved of its kind on display in any UK national collection. The sculpture, which was probably created in the Midlands, is a rare survivor of the Reformation when almost all religious imagery was lost or destroyed. It is speculated that it escaped destruction by being exported to the Continent, whether shortly after its creation or when imagery of its kind was no longer permitted. The work of an unknown master, the figure bears the marks where people have repeatedly touched or kissed it as an act of devotion with the face of the Virgin and the foot of Christ both worn as a result. Having suffered no major breakages, it still bears large portions of the original decoration including imitation jewels on the chest of the Virgins and traces of the original red and green painting and gilding. Kept at the Redemptorist monastery in Saint-Truiden, Belgium, for many years, it was purchased by a famous collector, Dr Albert Figdor, in the late 19th century. Sold at auction after his death, it entered a European private collection where it remained until it was sold to Sam Fogg from whom the British Museum, thanks to support from the Art Fund, National Heritage Memorial Fund and private donations, acquired it. The sculpture is on display in the Sir Paul and Lady Jill Ruddock Gallery of Medieval Europe. 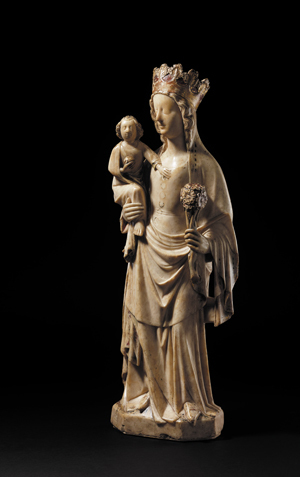 PICTURE: Alabaster Figure of the Virgin and Child, 14th century, England, © The Trustees of the British Museum.